He was a 28 (or 24) year old bookkeeper from Salem when he enlisted in Company F, 35th Massachusetts Infantry as First Sergeant on 26 July 1862. He mustered out on 29 November 1863. 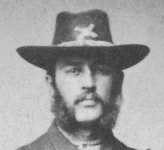 He then enrolled in Company K, 2nd Massachusetts Heavy Artillery, as 2nd Lieutenant at its initial organization, his commission dating from 9 October 1863. He was promoted First Lieutenant 17 January 1865, and mustered out with his Company on 3 September 1865. By 1879 he was a justice of the peace and a member of the Grand Army of the Republic (GAR) Post No. 34 in Salem, MA. Service from Soldiers, Sailors, and Marines.1 His post-war activity from a Salem City Directory for 1879. His picture from a CDV at the Library of Congress, donated by Tom Liljenquist.